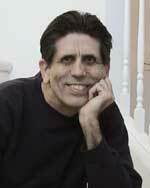 The other day one of our Aikido Journal staff members was speaking with a well-known senior instructor. Apparently, my name came up during the course of the conversation and the instructor confided that he thought I had become caught up in “a cult of O-Sensei.” I was certainly caught off guard by this casual remark, but after mulling over what he said I decided I was not in the least bit offended. At the same time, I must confess it did cause me to stop and think for a moment about how others might view the orientation and content of this magazine. I would be the first to admit that an occasional reader of the Aikido ]ournal might be left with the impression that we are rather “obsessed” with the subject of the Founder of aikido, Morihei Ueshiba. Indeed, in the several thousands of pages we have published in our twenty-one years, the life and art of this one individual have clearly received a disproportionate amount of coverage. Why such a fixation on the Founder? To be perfectly honest, this whole effort was sparked by an intense personal interest I had in the subject starting early in my aikido career. I made a trip to Japan in 1969 shortly after the death of O-Sensei to train and research the roots of aikido to satisfy my own curiosity. I had always been fascinated and inspired by the Founder and wanted to find out everything I could about this extraordinary man. However, I left Japan some ten weeks later discouraged by the scant amount of historical material available on Morihei Ueshiba. Here was one of the giants of Japanese martial arts and, at that stage, there was only one biographical study—a rather uneven one focusing predominantly on the influence of the Omoto religion on aikido—and no technical examination on the Founder’s art at all. Under such circumstances, it would not have been possible for anyone other than those who had extensive contact with O-Sensei to grasp the originality of his art and philosophy. 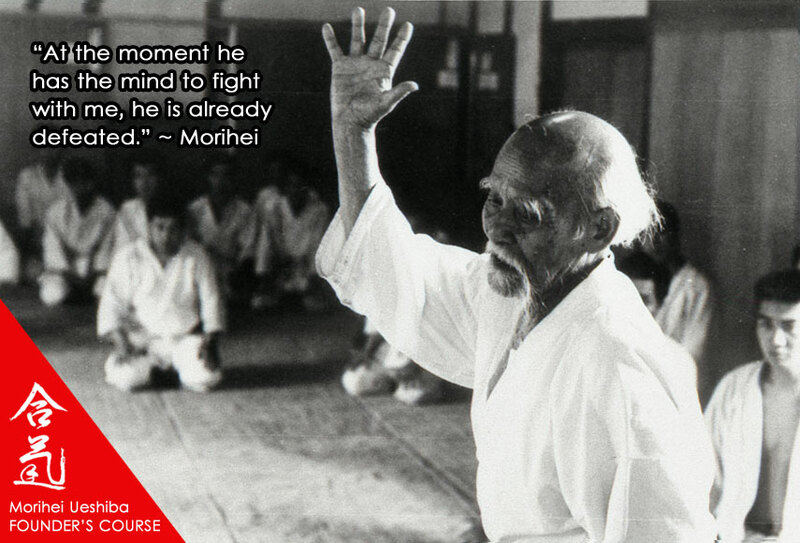 Though there have been a number of pioneer figures in twentieth century Japanese martial arts—Jigoro Kano and Gichin Funakoshi are two names that immediately come to mind—the figure of Morihei Ueshiba stands out not only for his technical expertise, but also for his ethical vision of aikido as a means of self-defense that also assumes responsibility for the well-being of the attacker. This concept was at the heart of his message and the cornerstone on which his vision of budo as a means of achieving the peaceful resolution of conflict was built. Although other martial artists, both classical and modern viewed the sword as an instrument that transcends killing and destruction, the Founder was particularly and uniquely influenced by the thinking of Onisaburo Deguchi of the Omoto religion. He showed a deep respect for the sanctity of life in all its manifestations in nature’s creation. It is perhaps this lofty vision which accounts for the universality of Morihei Ueshiba’s message, which transcends cultural boundaries and religious doctrines. But, Morihei Ueshiba’s broad appeal by no means ends there. He was a heroic figure in many respects who lived in exciting times and whose life was interwoven with those of many exceptional individuals of Japanese society. The Founder was the proverbial “driven man” who focused his energies on his own training and ventured forth on a unique voyage of inner discovery that culminated in the birth of aikido. On a more mundane level, Morihei was an example of the virtues of hard work, perseverance, and dedication to purpose. Although the child of a well-to-do family who enjoyed the support of his father and wealthy relatives well into adulthood, he always maintained a modest lifestvle and displaved a near total lack of interest in financial matters. Morihei developed a powerful physique while at the same time maintaining a childlike flexibility throughout his 85 years. He was essentially a vegetarian who shunned alcohol for the last half of his life. In short, he set a fine example, which drew both young and old to his side for nearly half a century and inspired them to improve themselves. Our detailed research into the life of the Founder has revealed many of his human dimensions as well. But far from diminishing his accomplishments, these new insights have only served to enrich our understanding of a complex man and render him more accessible to those who have set out on the path of aikido. I have noted in the years following Morihei’s death what I regard as a disturbing tendency to elevate him to a “divine” level in the eyes of practitioners. This has been the result of the dissemination of a small amount of carefully filtered historical information and the gradual relegation of his marvelous technique to “museum-piece” status. The Founder has become largely irrelevant, outside of being a portrait on a wall, to many practitioners in their daily training. Morihei has also been criticized by some as an ineffective teacher who cloaked his teachings in incomprehensible religious babble. Certainly he did not apply modern pedagogical theory in his dojo instruction, as he received only a middle school education during the Meiji era and was never exposed to such teaching techniques. Moreover, his view of the cosmos and vocabulary were those of an Omoto believer and would obviously be understood with difficulty by the uninitiated in the same way that Western philosophical thought would be impenetrable to those lacking a knowledge of the Judeo-Christian tradition. Morihei Ueshiba was an inspirer and visionary whose example galvanized tens of thousands of students into action to better themselves through aikido training. Whether or not he was the best technician or strongest martial artist is totally beside the point. He grasped certain profound truths of universal applicability that suggest real solutions to conflict in a world intimidated by the existence of weapons of mass destruction. These are the reasons I have been captivated by the geniality of the Founder throughout all these years and have made his life and work the centerpiece of Aiki News’ publishing efforts. We will continue to document every possible aspect of his life and record and interpret his teachings in a conscientious and detailed manner. It is my sincere hope that one day all who are drawn to aikido will have easy access to his many insights and discoveries. Perhaps these lines will only serve to reinforce the view that Aikido Journal has been caught up in a “cult of the Founder.” But quite frankly, I can’t think of a more worthwhile or engrossing pursuit. level of aikido to accelerate your progress! 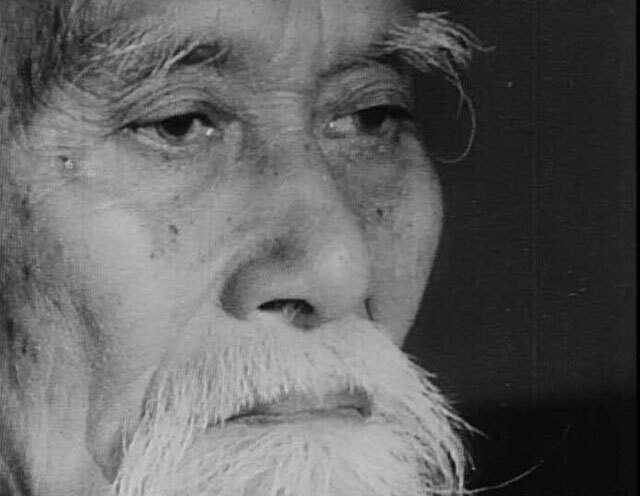 The Morihei Ueshiba Founder’s Course is O-Sensei’s video legacy starting in 1935 and covering a span of 34 years until just before his passing in 1969. 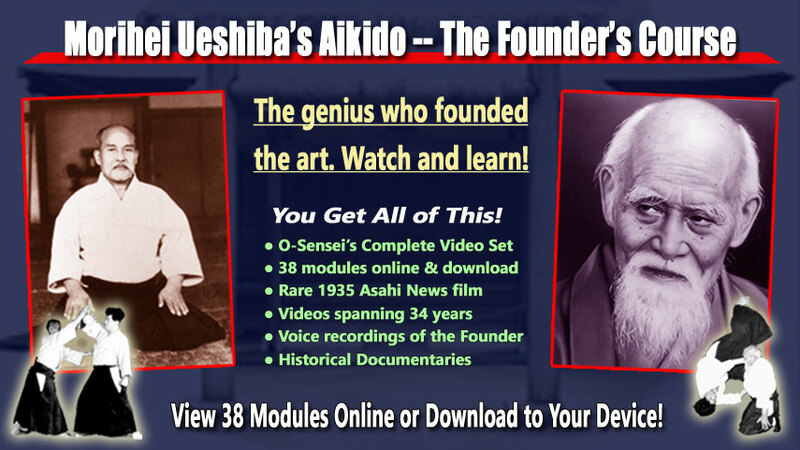 Besides the more than 30 films of the Founder, the course includes three rare audio interviews of O-Sensei with complete subtitles. These are wonderfully intimate conversations with the Founder that convey his bright personality, playfulness and sincerity. In addition, the course includes a series of video documentaries by Stanley Pranin on the life of the Founder and the spread of his art worldwide.